Just as plastic spikes in golf shoes changed the face of golf, so have the brightly colored alignment sticks you see in almost every tour pro's golf bag. The pro's use these to help them with many parts of their game. In fact, as an instructor, they are an important part of my "medicine" bag I carry to the lesson tee. Following are a few "basic" uses for the sticks. I will break it down by different parts of the swing which you may be trying to improve upon. 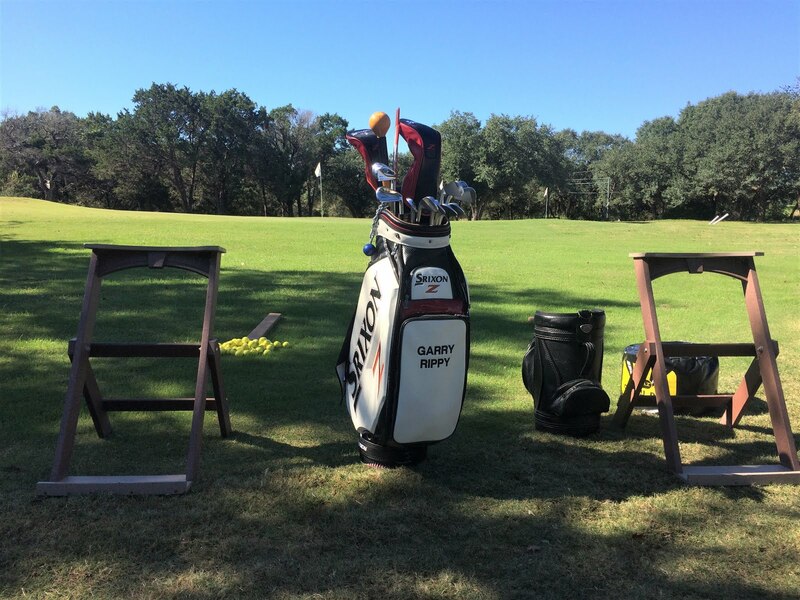 JUST A WORD OF CAUTION: ANY TIME YOU ARE MAKING A GOLF SWING UTILIZING THE STICKS, I RECOMMEND STARTING WITH SMALL SWINGS TO REDUCE ANY RISK OF INJURY! PARTICULARLY IF YOU ARE USING THE RODS IN A VERTICAL POSITION. Alignment: Use two alignment sticks as pictured and form a "railroad" track to the target. After some practice, remove the rods and you should be able to visualize the path to the target. In the pictures below I have added a third stick for proper golf ball position. For the irons and hybrids, the ball should be positioned under the front cheek and for the driver and fairway woods, the ball will be positioned near the front arm pit. Path: Use two alignment sticks, one for the stance line and the other on the target line. The stick on the target line will be set at about a 30 degree angle into the ground. Tee the ball about 1" toward you and about 1' from the back of the stick. By teeing the ball you will not have to keep moving the sticks. On your take away, if you tend to take the club on an outside path, the rod will stop the club. The club should be swung slightly to the inside of the rod on the take away. On the downswing, if you come over the top, you will strike the stick on the target line. The goal is too start with small swings and avoid hitting the stick on the target line. Back Swing Coil or Wind Up: Put one alignment stick through the belt loops on the front of your pants (or shorts). With your lead hand, hold an alignment stick on the chest. Use your trail hand to make a back swing. Now make a back swing with the trail arm. Note how the shoulders turn 90 degrees from the address position and the hips turn about 45 degrees. At the impact position, the hips have rotated to an "open" position yet the shoulders have only opened slightly. You must have this "separation" between the hips and shoulders to attack the ball from the inside and not come over the top. Prevent the Sway: Place one alignment rod on the stance line and stick a second alignment rod upright just behind the middle of the back foot. On the back swing, maintain the position of the back leg. Do not let the back knee touch the alignment stick on the back swing. If you turn the hips properly, you will not touch the stick. Stick an alignment stick vertically in the ground and let your tush touch the stick at set up. Also place a stick on the stance line. Tee the ball up so you won't have to keep moving the sticks. On the down swing, maintain contact with the alignment stick. 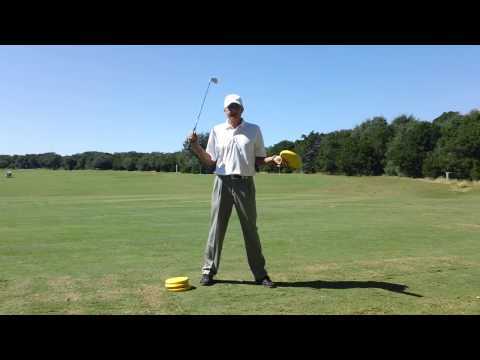 This will help you stay in your posture through impact. In other words, you have not "stood" up through the swing. The "standing" up can cause shots to be hit on the toe or thin. stick as your hips rotate toward the finish. At the finish of the swing you will go ahead and move to your front leg and you will lose contact with the alignment stick. Insert an alignment stick into the grip end of your club (7 or 8 iron) as pictured. This will not effect your grip of the club. Now take your set up with a narrow stance and the alignment stick will force your hands to be in front of the ball. This is what you want to feel at the moment of impact...the hands lead and the club follows. Make a 1/2 back swing and when you start down, allow your body to rotate toward the target. The alignment stick should not hit you in the ribs if performed correctly. Note how my arms and club have maintained the letter "Y" from back swing to follow through. Post Impact Left Leg Position: Place an alignment stick on the stance line and then stick one in vertical in the ground just outside the front leg and even with the middle of the front foot. On the down swing, rotate the hips so you do not hit the alignment stick. After impact, the front leg has not touched the alignment stick. At the finish of the swing, you should not move the alignment stick. You should finish "tall" with the majority of the weight on the front leg. Finish: Place an alignment stick on the stance line and also place an alignment stick on the ground just outside your front leg perpendicular to the target line. At the finish of the swing, your hips should be square to the alignment rod in front of your stance. Grip an alignment stick as pictured. Be sure and hold it about 6" above the ground and your grip pressure should be light not TIGHT. On the down swing you want to hear a loud "WHOOSH" as you swing the alignment stick to the finish. The sound should be the loudest at the bottom of the swing...not too early or not too late. After you do this drill a few times, take out a driver and when you make your swing, you want to hear the "WHOOSH" at the right time. There are certainly more ways to incorporate alignment sticks in your practice. These are just a few which I find I use quite often when helping my students with the full swing. In an earlier post, I used alignment sticks and my shadow as a training aid. Give that post a look as well.